When last we met, Project Runway had just bid adieu to Raul after he sent a lackluster red carpet gown down the runway, and Andrea had gone missing in the middle of the night. I know I owe you fabulous readers an Episode 4 review. Don't you worry... a Lannister always pays his debts (wrong show?). 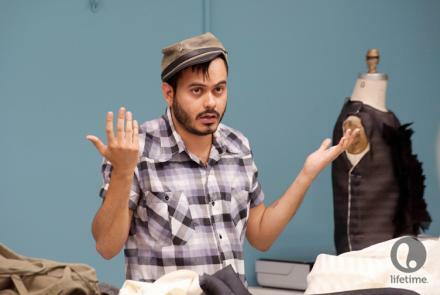 So instead of pretending like it never happened, today you are getting a special twofer: a jam-packed extravaganza review of the last two episodes, which could be sold in a separate DVD pack and branded Project Runway: Raul's Revenge. Hey, it's better than Project Accessory (burn). Enough jibber jabber... we have a lot to cover! Goodness gracious. That was a disaster. After last week's candy catastrophe, Project Runway seemingly apologized for their bad behavior and gave us a little gift for sticking with them: a team challenge. Wahoo! I love a good team challenge because it always unleashes the crazies onto each other. Not that anyone is making a claim that people who go on reality TV shows are totally sane, but some of these people take the cake when it comes to psychotic antics. Add in some Runway alums and you have an episode that greatly improved on its predecessor.